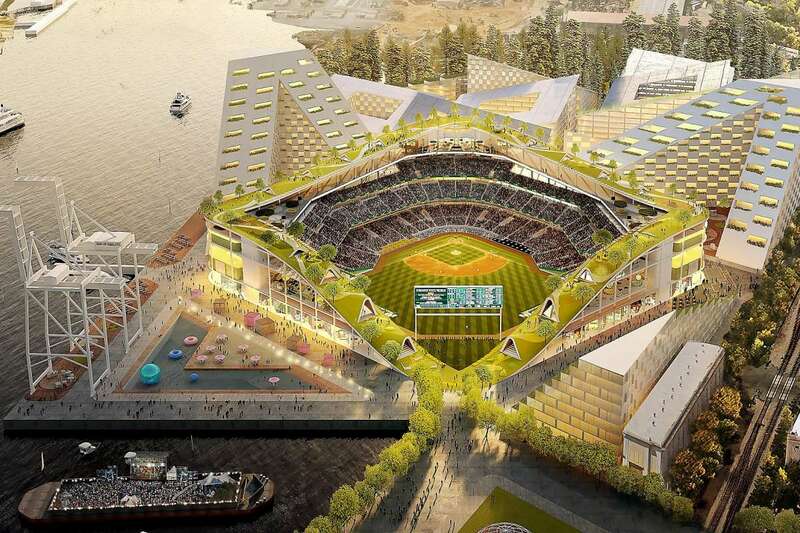 When the Oakland Athletics unveiled a cutting-edge ballpark design yesterday that included green roofs and gondolas, there was some snickering about the team pushing hippie dreams. But alternative transportation to the ballpark is an idea whose time has come. Flash back to the first era of MLB ballparks, when success meant access to subway lines, trolley lines and ferries. Ballparks like the Polo Grounds and Yankee Stadium were located close to subway and rail lines — a reality of doing business in New York City in an era where few cars were sold to consumers. And New York remains reliant on mass transit. No surprise the New York Mets chose the Shea Stadium location when looking at a Citi Field site: the area is well-served by mass transportation. But with the rise of the suburban ballpark, cars ruled when the likes of Dodger Stadium and Kauffman Stadium were planned. Big, expansive parking lots were key, forcing the ballpark to be a destination that didn’t necessarily generate additional development. We are now in an era where much is expected of any new MLB ballpark, including plenty of associated economic activity. 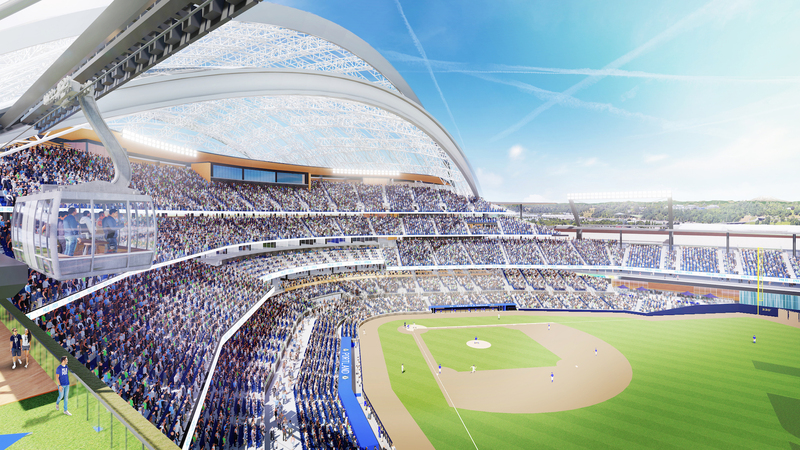 Parking is not the important component of a new ballpark site: the ability to serve as an economic generator is more important, as we’ve seen success stories in San Diego, Minneapolis, Denver and San Francisco. One key driver of Target Field’s success as an economic generator comes from a form of mass transportation not seen in Minneapolis-St. Paul for decades: light rail. Former Gov. Jesse Ventura pushed light rail, and it’s grown to the point where major routes in the Twin Cities are all served by light rail. In a triumph of urban planning, every major sports venue (Target Field, Target Center, U.S. Bank Stadium, Williams Arena, TCF Bank Stadium, Allianz Field, Xcel Energy Center, CHS Field) is served by the Green Line light rail running between the two downtowns. Head to any event in any of these venues and you’ll see the rail cars packed with fans. Of course, light rail is a proven technology, and its use for sports venues wasn’t the biggest reason for its adoption across the Twin Cities. The next generation will feature alternative modes of transportation, if folks like Elon Musk and Dave Kaval have their way. No surprise, then, that the Portland Diamond Project included gondolas in its renderings for a proposed new ballpark. And we’re seeing another alternative transport method in the works: Elon Musk is moving forward with plans for a tunnel between Dodger Stadium and a yet-to-be-determined western terminus to relieve traffic to Los Angeles Dodgers games. There’s no doubt getting to and from a Dodgers game can be an ordeal, especially if you time it to hit the beginning of the game: local streets like Sunset Boulevard are jammed, and rush-hour traffic on the 101 and 110 is already bad enough, even without the influx of Dodger fans. So The Boring Company, headed by Musk, has proposed a zero-emissions underground transportation system from the Los Feliz, East Hollywood, or Rampart Village neighborhoods west of Dodger Stadium. The high-speed system would transport fans from the western terminus to Dodger Stadium in under four minutes, traveling underneath Sunset Boulevard and Vin Scully Avenue. The western terminus would be located at Metro Red Line station, providing further integration into the Los Angeles transit system. The cost: $1 each way. Musk’s proposals for tunnels in Los Angeles have met with some neighborhood opposition outside the proposed Dodger Stadium line, but so far planning continues on the Dugout line. None of these alternative transport methods will completely ease congestion to the ballpark. But given current demographic trends — car sales continue to decline as millennials buy fewer vehicles and ride sharing increases — any planning on a ballpark or sporting facility in an urban area needs to recognize the shifting attitudes people are taking on transportation and entertainment. We’re seeing it happen: the Atlanta Braves increased space for ridesharing services like Uber and Lyft in 2018 after greater-than-anticipated demand in 20197. Ironically, the attributes that made the Polo Grounds location so attractive — location, location, location when it comes to mass transit — will play an increasingly large role in future ballpark sites.